Around 288,000 new jobs were created in June 2014. Some US cities have recovered from financial downturn due to rapid development in local economies. Around 288,000 new jobs were created in June 2014. Some US cities have recovered from financial downturn due to rapid development in local economies. The job growth in these cities is good and a lot of youths flock to these cities to get employment. On the other hand, some cities have very limited job opportunities. They have a very high unemployment rate and as such there is a fierce competition amongst the job seekers. 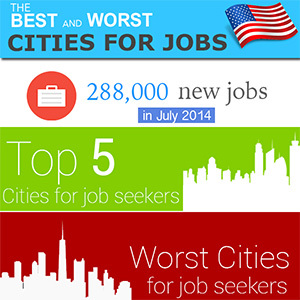 Here are the 5 best and worst cities for job seekers. If you want to enter into the job market, then you should definitely check out this infographic and avoid getting lost amongst the crowd.